Today, most of the students at my school had make-up classes because of a future Monday where there will be a bank holiday. Normally, the school does not hold classes on Fridays, so instead of traveling around Europe or exploring London, most students spent a thrilling day indoors instead. I normally work on Fridays, so I actually welcomed the opportunity to wake up at 8AM instead of 7AM. To officially celebrate the weekend, a few friends and I decided it would be nice to go out to dinner: something to help us wind down after a week of battling illnesses, papers, and three-hour long lectures. Both our original two restaurant choices were fully booked for dinner, so we ended up going to a place nearby our dorm. We had heard decent reviews from other friends, but we had never tried the food for ourselves. 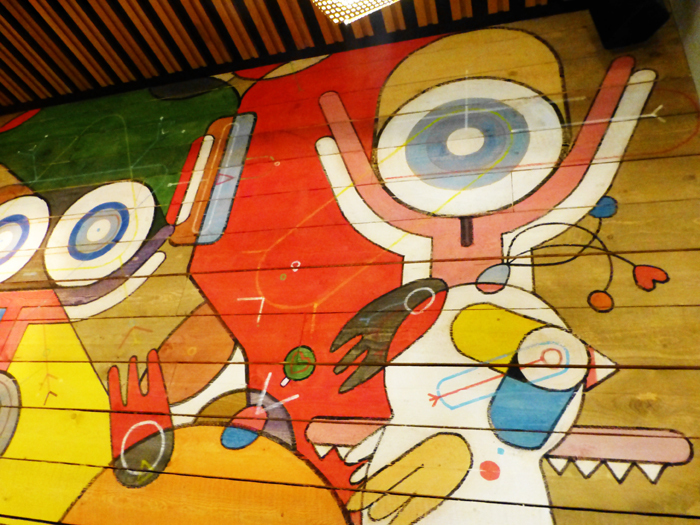 Giraffe has, as nicely said by one of my friends, “a funky vibe.” The walls are vibrantly painted with cartoon-ish characters, and the music comes straight off the Top 40 list. All the tables were full, but we didn’t have to wait long. With so many customers, we had high hopes for Giraffe, but at the same time we were hesitant about being too enthusiastic about a chain restaurant. A friend and I shared something from the Feel Good Dinner Menu. Every day after 5PM, you can get a starter and a main course for £9.95. We went with the soup of the day, which comes with garlic focaccia, and the penne margherita & mozzarella bake. 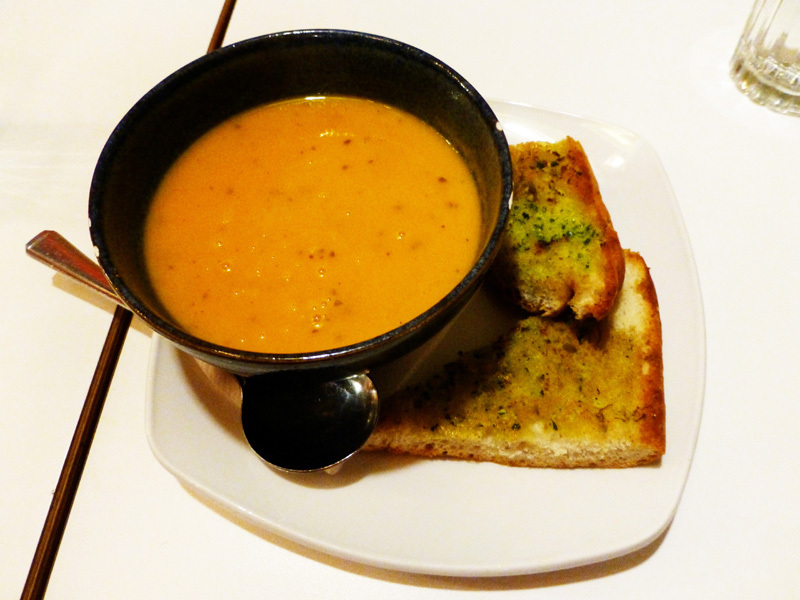 The soup of the day was carrot and coriander, and both my friend and I found it delicious. The carrot flavor was not too overpowering, and the consistency was not too thick either. The focaccia on the side was delicious as well, crisp and perfect for dunking into the soup. 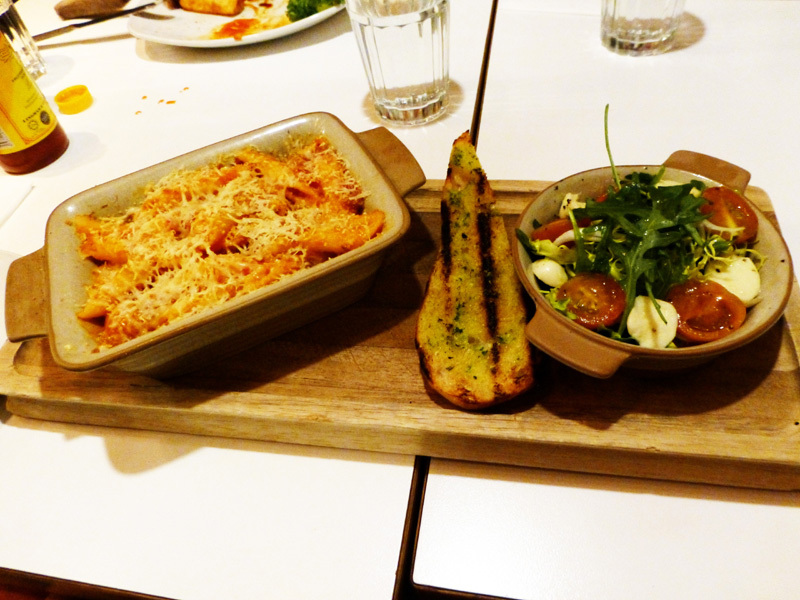 The penne bake was good as well. The menu described that the pasta would have an herby, cheesy focaccia-crumb topping, but we found that the topping just seemed like cheese sprinkled on top. In addition, the rocket salad had too much dressing, and I could see my poor rocket leaves drenched in olive oil. The garlic bread was grilled, a nice touch. For one person, the Feel Good Dinner Menu would certainly be filling enough, and it’s a pretty good value compared to the other offerings. 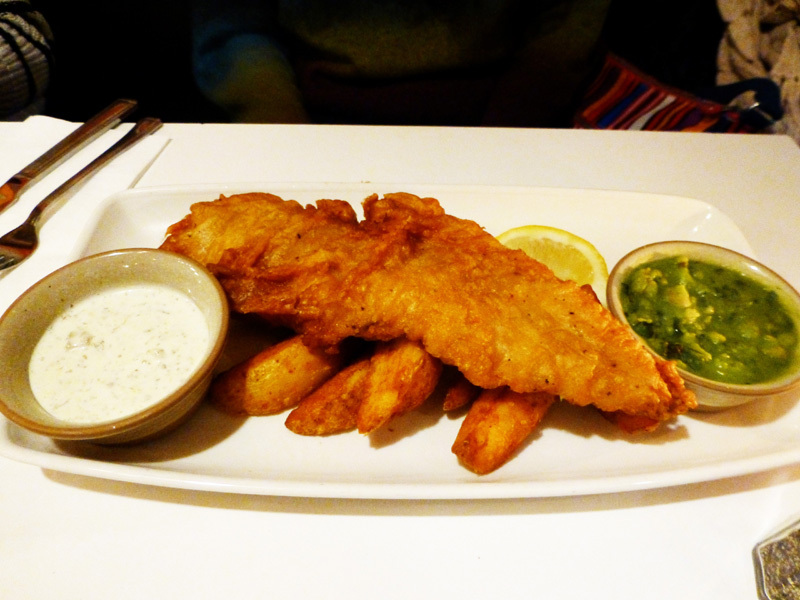 Another friend had the beer battered haddock (£9.95). The exterior was crunchy, but she noted that she has had better. The fish was coated and fried with the skin on, and my friend does not care for the skin. In addition, the fish had bones – a small yet important detail that the waitress or menu failed to mention. My friend too one big bite and almost choked on a bone. The mushy peas also were not bad but also nothing to rave about. Also, there were a scant amount of potatoes on the plate – as in five pieces. 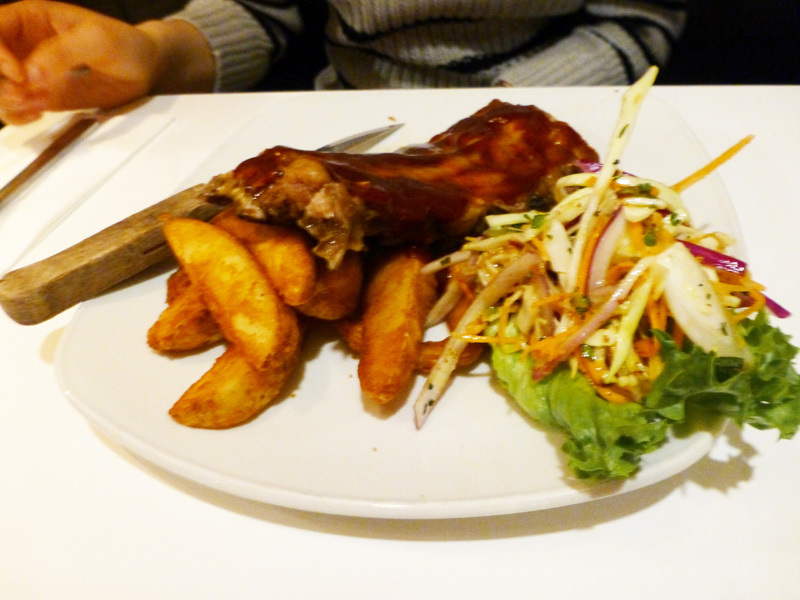 The last girl in our group had half a rack of BBQ baby back ribs (£8.95). The ribs were well-sauced, but nothing with as much meat as you would find in the American South. The waitress helped to also change her order from skinny fries to thick-cut potatoes. The potatoes were not soggy, and the side salad balanced out the dish. While the food quality at Giraffe received positive remarks, the portion sizes made us feel that the dishes were a bit overpriced. In addition, service was slow. The girl who got the ribs came late and ordered ten minutes after everyone else, and yet she was the first to get her meal. The rest of us waited at least another ten minutes, which meant that her food sat getting cold. Overall, none of us hated Giraffe, but there were a few things here and there that eventually added up. It won’t ever be our first choice for dinner, but we did notice that the restaurant has brunch. Also, the dessert and cocktail menu looked promising.